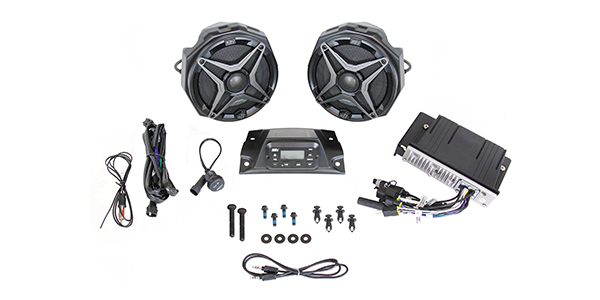 SSV Works announced the launch of the only OEM audio solution available for Honda’s new Talon SxS line. Shipping in March, the plug and play kit for the Talon 1000R and Talon 1000X has an MSRP of $647.95 and is available exclusively through Honda Powersports dealers and shop.powersports.honda.com. SSV Works’ pair of 6.5-inch marine-grade powersports speakers for the Talon 1000R and Talon 1000X include a coaxial Ti tweeter and are engineered to be heard while riding, even with a helmet. They feature seamless integration molded into the kick panels without compromising leg and feet room. The included MRB3 media controller includes Bluetooth, Aux-in, FM and AM sources, compact control unit for easy mounting, weather-proof durability, 4-channel 200W max power, control volume/track/play/pause, six preset EQ options, plug and play installation and hyper-white LED back lighting.